Another York pub in another historic building. This pub felt a bit more cultured. I settled down into a comfy leather armchair. Ales were Black Sheep Velo, Wells Bombardier, Copper Dragon Golden Pippin, Leeds Yorkshire Gold & Timothy Taylor Golden Best. Cider was Addlestones. Nice enough pub with a good selection of ales. Nice pint of Caledonian "Flying Scotsman. Small Tardis type pub, which has three bars in a tiny space including a library bar. Excellent pint of Tim Taylor's and a good curry for less than �10. Very close to the Minster. So many pubs around there I'll have to make another visit to check the rest of them out. 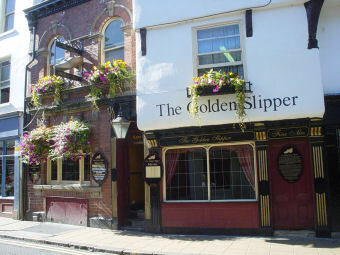 Visited this pub at the weekend and I would highly recommend this pub if you are visiting York. There were 6 guest ales on show, TT Golden Best, Golden Pippin, Saltairre Blonde. These were really well kept and I have a lovely time watching my 2 horses sadly depart this world in the grand national. There was a goth wedding taking place down the road at the same time which was a bit surreal.. The pub was friendly, warm and tidy... and reasonable value to... there is a very small smoking area at the back.